When Whole Foods Market expanded its Boca Raton Market they engaged Michael Singer Studio to design the building’s new exterior spaces including the outdoor café courtyard gardens and plant market. A small sculptural water element was integrated into the covered entry space with a semi-circular form following the shape of the existing rotunda. 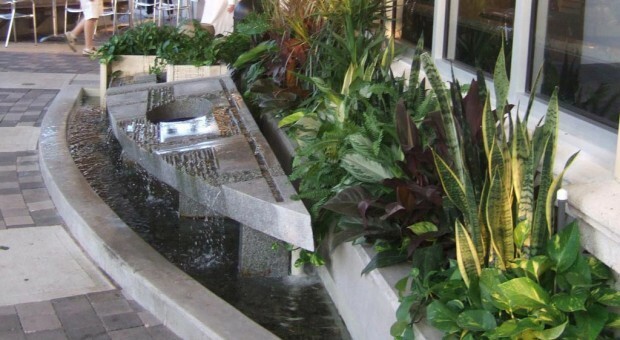 The water element is comprised of a large curving granite slab and planters with tropical vegetation. The water element surface is composed of split faced granite channels that guide water flow from its source below the slab to the curved edge and into a shallow pool below. Raised concrete planters with sculpted textured panels and integrated reclaimed wood seats define a series of discreet gathering spaces around the café gardens. Dense native and tropical vegetation fill the raised planters and adjacent at-grade beds to enclose the spaces. Additional shade is provided with umbrellas and shade canopies. The plant display area is a series of cast-in-place concrete pedestals with reclaimed wood tops and a large covered display area topped with flowering vines. Much of the paving and trees that existed prior to the renovation were protected and re-used for the project. Engineering: Calen Colby, Brian Beaulieu, Mercer Bonney at Oest Associates Inc.